Suitable for FIRST RESPONDER, LIFEBOAT, DOCTOR ON CALL etc. 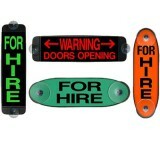 An illuminated sign for your wind..
An illuminated sign for your windscreen, available in either green or amber. Other colours also a..